Trash on many of Ecuador’s beaches can be an unsightly issue, one which thankfully is being resolved to a large degree through a national-scale plastics recycling program that was implemented just one year ago. In fact, Ecuador was listed in the Guinness Book of World Records for collecting 1.5 million plastic bottles in less than fifteen days! Here is an article from April 24, 2013 about the successes of the newly created recycling program (Google should provide the option at the top of the page to translate the article to English). Thank goodness for the new plastics recycling program to help keep plastics off the beaches in Ecuador. Recycling here is not as organized as what people might be used to in their home country with specific bins that are collected separately from household trash. Here, the trash collectors rip open every bag of trash and separate the plastics while in transit between houses. Once we discovered this, we began to put our plastics in a separate bag to save them the trouble and mess. Here along this stretch of the coast, trash is collected by the municipality 2-3 times per week (depending on the location). Entrepreneurial types now also drive by in trucks and pay people by the kilo for their plastics. The same goes for aluminum and steel. Multiple times per week you might hear a fellow in a truck, driving up and down the road, honking and yelling “chatarra, chatarra” which basically translates to “metal junk [plus old batteries].” They’ll buy steel cans, empty paint containers, old appliances, you name it. The price isn’t too bad either (we received a dollar for a couple of old paint cans and an old fan the other day) so it motivates people to collect what they can find laying around to sell it as a supplemental source of income. Instead of being recycled per se, these scrap items are typically reworked into new products, a more direct and efficient use of the metals. 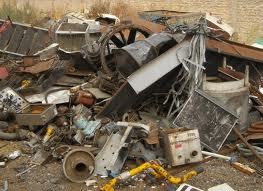 House-to-house collection and payment for metal junk or “chatarra” is Ecuador’s current solution to metals recycling. Up until the last 10 years or less, plastic bottles were a rarity in Ecuador (and Latin America). Instead people purchased their sodas out of returnable glass bottles, just like back in the US up until the 1960s or 1970s. It’s interesting to note how the culture of plastic is more or less just arriving to Ecuador while in other countries, like the US, there is a subtle, but noticeable shift away from plastics and back towards glass due to human safety and environmental concerns. Beer in Ecuador is still predominantly sold off the back of trucks by the “jaba” (pronounced “hah-bah”). Jabas are the sturdy plastic containers that hold twelve 22 oz glass beer bottles. 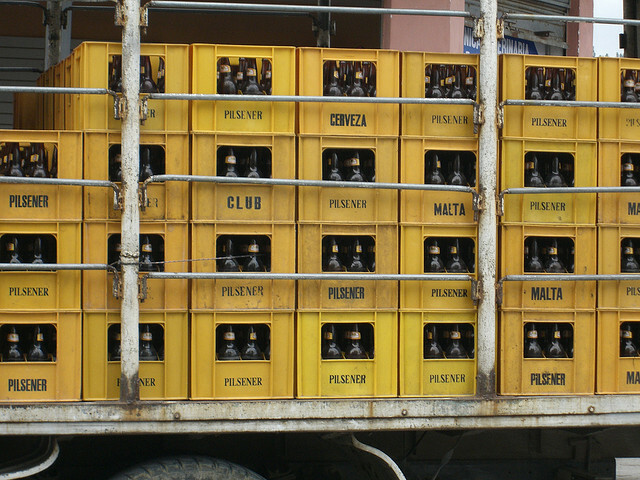 Pilsener, Ecuador’s national beer, can be bought for about $0.67 per 22 ouncer off the back of the beer truck. Once you’ve emptied your jaba you take it back to the store where the owner will take your empties and replace your jaba with full bottles, usually priced at roughly a dollar per beer. Or if you catch the beer truck a full jaba will usually cost you about $8-$9. Note: Hang tight to your jaba because these cases alone will cost you $7 (or more) to replace. The national beer of Ecuador is Pilsener, although Brahma and Budwieser are becoming more common. Sadly, more and more people are looking to the US-culture of drinking beer from a 12-oz glass container and these smaller-sized bottles are beginning to become popular among more elite Ecuadorians. Unfortunately, these smaller bottles are neither returnable nor recyclable (as of yet) and often the emptied bottles are abandoned haphazardly on the side of the street or on the beach by the unconcerned party-goers. Grrr..I hate that! 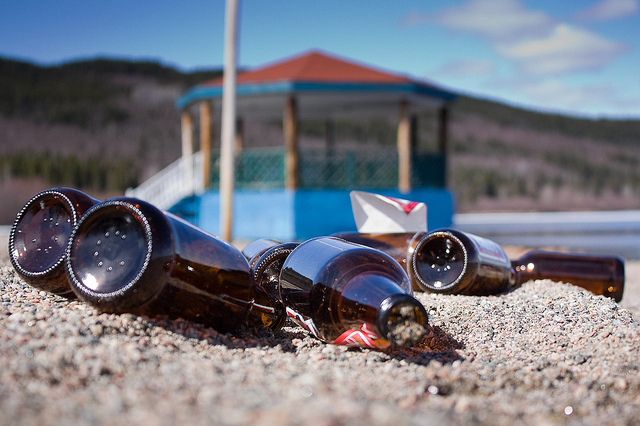 Without any monetary value associated with them, smaller beer bottles just get dumped. 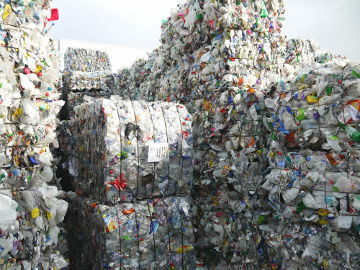 Ecuador’s new recycling program for plastics might one day create the catalyst for an eventual glass recycling program. Like I mentioned in the previous blog post, it truly is fun to watch all the shifts that Ecuador has been making in a relatively short period of time. I will end this post with an photo ode to the “22 ounce Pilsener and ceviche on the beach” experience. Come down and try it for yourself! 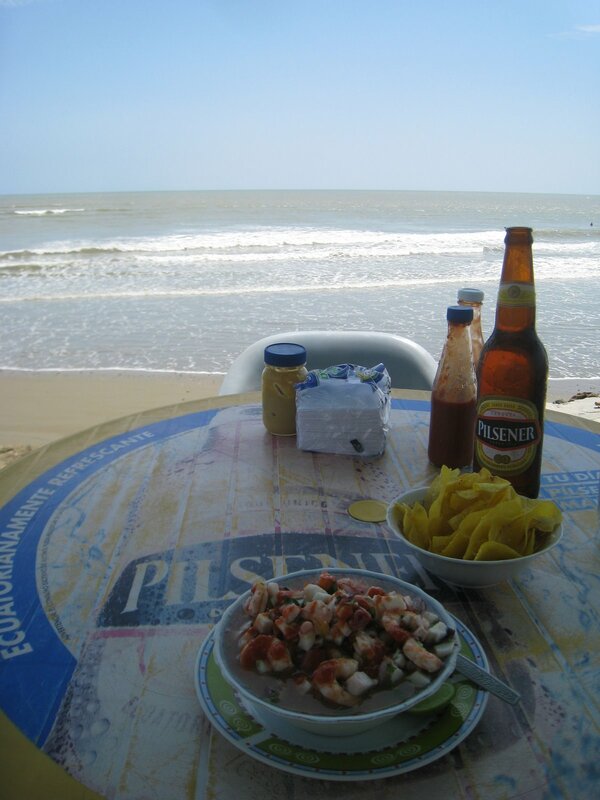 Nothing quite like enjoying a cold beer and a ceviche on the beach. It has been truly amazing to watch all the changes that have taken place in Ecuador since Tom and I first set foot here in 2005 to visit the Galapagos. We returned the following year for a water quality sampling expedition in the highlands which ended with a very spontaneous decision to purchase what would later become our home in Crucita. Most notably, the changes we have witnessed here have involved major infrastructural improvements such as roads and bridges. For example, the highway connecting Crucita to the major city of Portoviejo was a dusty two-land washboard road, full of enormous potholes and a nightmare to drive at night. Today, it is a smooth (relatively speaking) four-lane highway with a median containing large street lamps. The bridge connecting Bahia to San Vicente was another enormous project that has vastly improved access to growing towns such as Canoa. We remember the days when we would cross the bay by passenger ferry for 10 cents (which is still an option for crossing if you don’t have a vehicle–you can catch a taxi or mototaxi to your final destination on the other side). 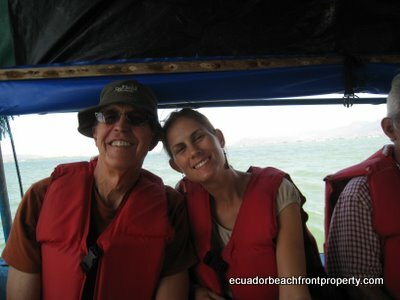 Crossing the bay in 2009 with my father-in-law, Wally, on his first visit to Ecuador. Tom’s folks have since moved here as full-time residents. Sometimes, if traveling with friends with a vehicle (this was before we could even dream of being able to afford our own vehicle!) we would have to wait, sometimes for a couple of hours, to get on the car ferry that transported vehicles to one side of the bay to the other. The car ferry used to transport cars between Bahia and San Vicente. Actually, we have rather fond memories from those days since we would use the wait time to hang out with friends, shop for tagua jewelry, and try exotic foods served by street vendors on the San Vicente side (avoid the grilled cow udder, by the way). 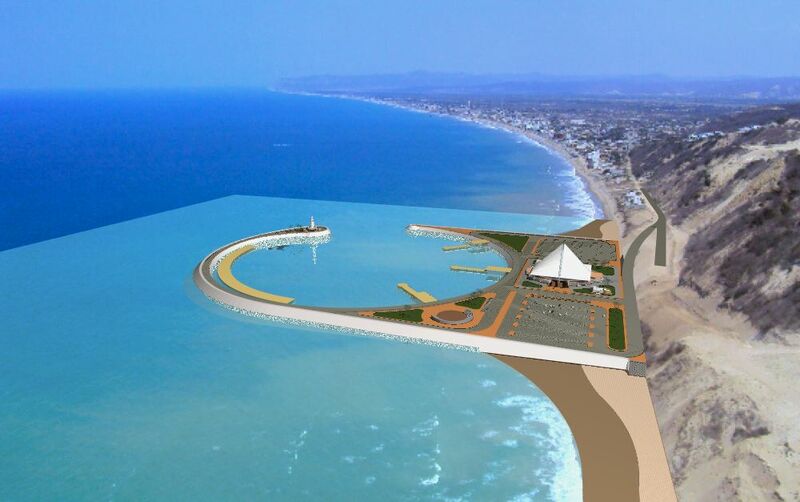 More large projects along the coast are in the works and are slated to begin sometime in the next year, including a marina on the far southern end of Crucita that will undoubtedly result in elevated tourism to the area (as well as real estate prices). There are also plans (which are still very much under discussion as to the actual routes involved) for the creation of a major highway connect Bahia to Manta in less than 50 minutes, allowing faster access to Manta’s airport, which *one day* will receive direct international passenger flights. The new coastal highway will also include a much-needed bridge between Crucita and San Jacinto/San Clemente (get oriented to this region with our Maps page). So the times, they are certainly a-changing. 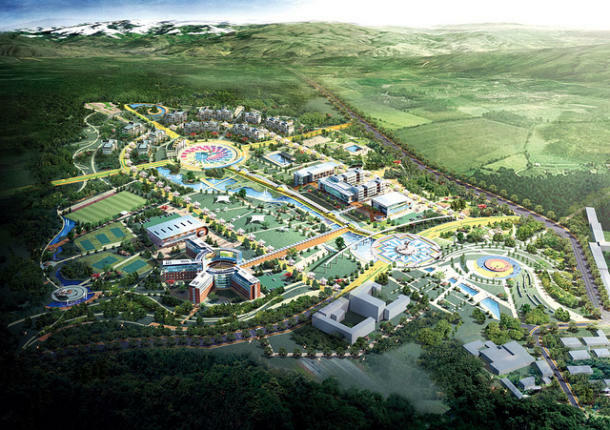 This news story, dated March 26, 2013, is part 1 of a four-part series about the creation of “Yachay, a planned ‘City of Knowledge’ that the Correa administration hopes will one day compete and collaborate with Silicon Valley, South Korea, Japan, and the other great innovation centers of the world.” It is a controversial project with many critics and naysayers but the simple fact that it is actually in progress is amazing. Part 4: An Ecuadorian Silicon Valley: Pipeliine to the future or pipe dream? We have enjoyed watching Ecuador’s projects come into fruition, especially those thought never to be possible. Who knows where this latter project will end up but it will be fascinating to watch how it unfolds over the coming years. The undoubted question is that Ecuador is determined to keeping progressing.